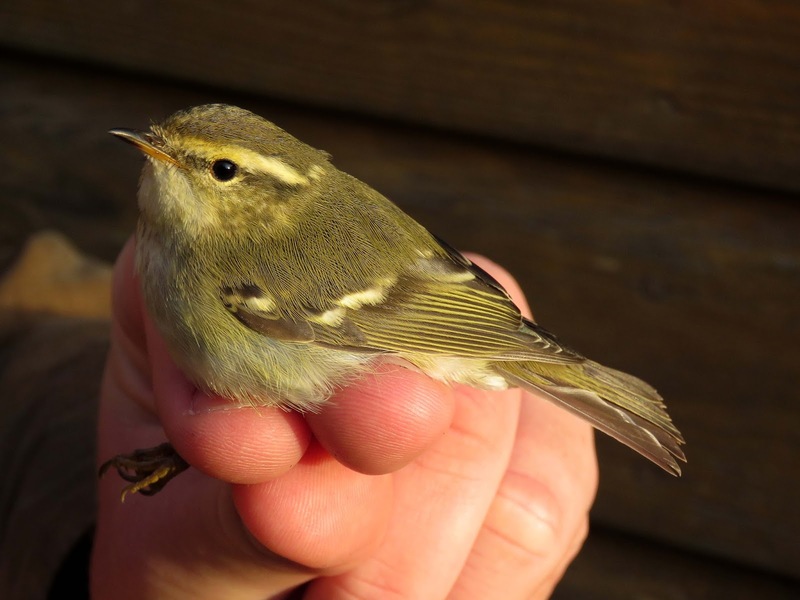 The highlight of the day was the catching of a Yellow-browed Warbler in the moat in the morning with a second bird also present in the trapping area. There were fewer grounded migrants in the area today but they still included two Firecrests, 30 Chiffchaffs, 16 Blackcap, three Ring Ouzels, 17 Redwings, 50 Robins and a Pheasant was an unlikely the first of the year here. There was also a bit of overhead movement with two White-fronted Goose, 22 Skylark, two Fieldfares, five Mistle Thrush, 30 Tree Sparrows, a late Yellow Wagtail, six Bramblings, 50 Siskins. three Redpolls and 50 Reed Buntings. There was limited watchng of the sea but an Arctic Skua and 12 Mediterranean Gulls were seen. Two Pearly Underwings were also trapped overnight.